Introductory Remarks – About Godfrey Bloom [ed note by PT: Readers may recall our previous presentation of “Godfrey Bloom the Anti-Politician”, which inter alia contains a selection of videos of speeches he gave in the European parliament. Both erudite and entertaining, Mr. Bloom constantly kept the etatistes of the EU on their toes.] 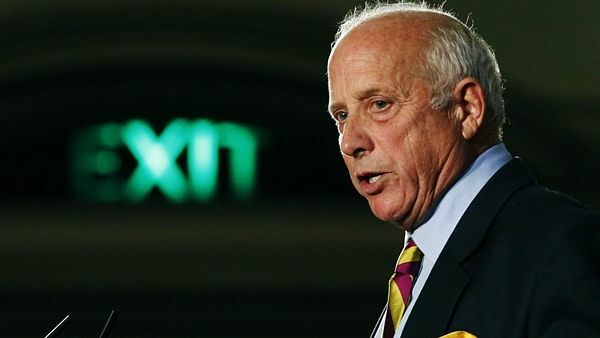 Godfrey Bloom, back in his days as UKIP whip Photo credit: Reuters Before becoming a politician, Godfrey Bloom worked for 35 years in finance and investment management. Discontent with over-regulation of this sector, he entered the world of politics in 2004, as a Member of the European Parliament. Bloom started as a representative for the UK Independence Party until 2013, then continues as an independent MEP. He is known as a fierce libertarian and a firm opponent of government regulation and centralization. Bloom is also widely known as a euro-skeptic and is currently heavily involved in the Brexit “Leave Campaign” as an independent activist. He is also a good friend of the Mises Institute Europe. In recognition of Mr. Bloom’s role at such a decisive moment in the history of the UK, the president of the Mises Institute, Jeff Deist, had the following words to say about Mr. Bloom: “It’s great to see Mr.
Godfrey Bloom: I voted to join what I thought was a free trade zone in 1975; indeed it was called “the Common Market” on the ballot paper. 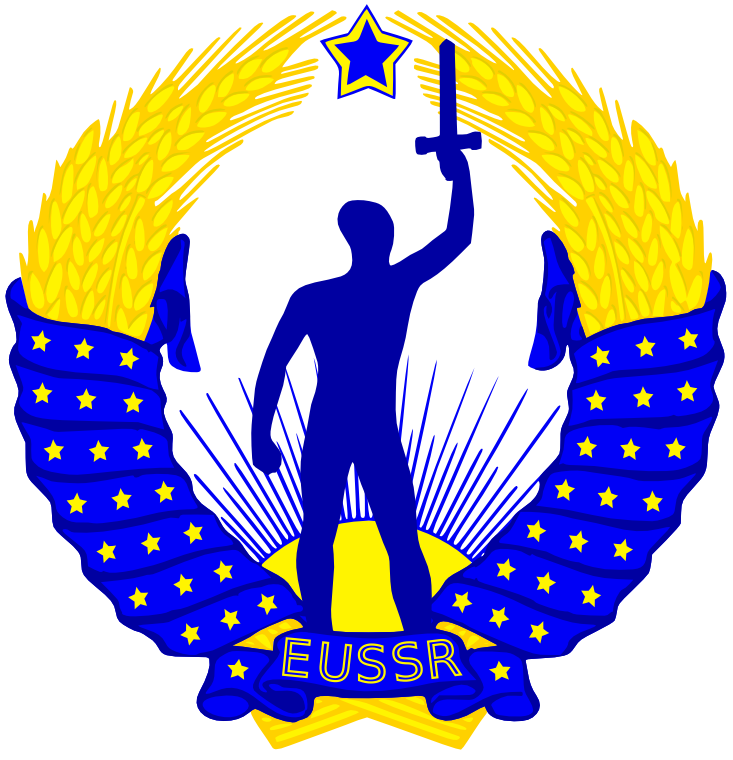 It now transpires that a federal superstate was the ultimate goal. We were warned of this by some politicians at the time, but neither I, nor most of the public took heed. Back in the seventies, we still vaguely believed our politicians told the truth. We had faith in our Prime Ministers, even though that might sound a bit naive today. It is also worth remembering Great Britain back then was at a low point in its historical trajectory, the lowest since the thirties and we were desperate. Claudio Grass: You are a very vocal speaker in favor of Brexit and a previous member of the European parliament for 10 years. At what point did you realize that the United Kingdom’s membership in the Union comes at the expense of its sovereignty and democratic values? Claudio Grass: In the 1990s you predicted the failure of the Euro over a ten-year period. Could you explain the factors that led to this? Where do you see the Euro is heading? Godfrey Bloom: I was managing a very successful fixed interest fund in the late 1980s and early ’90s. Of course, fixed interest was very unfashionable at the time, but I was briefed by my employers to examine the implications of a common currency. I had some of the top city analysts and statisticians at my disposal. I also had two months to produce my findings… it was all over in a week! The whole concept was flawed: we saw there could be no common fiscal policy or lender of last resort, nor was there any democratic mandate. We simply did not continue the project. 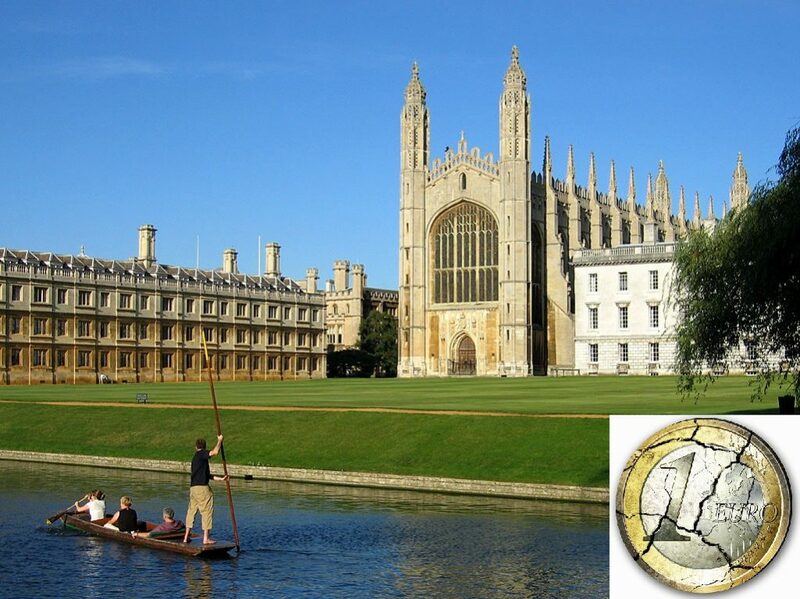 Hunting for the broken euro in Cambridge in the mid 90s. Where is it? Claudio Grass: As an international observer, I realized the mainstream arguments against Brexit are that the UK will lose many benefits of trading in a single market, as well as its current access to a much wider consumer base. What would be your counter-argument to that? Godfrey Bloom: I am genuinely amazed as a research economist that trade has anything to do with this debate. Contemplate, if you will, the notion that a political union is necessary for trade. It is so monstrously ridiculous, that I resent time spent refuting it. The UK imports and exports to the EU are on an unfavorable ratio of 80/20. Upon BREXIT the EU will crawl on its hand and knees and beg the UK to let them continue flooding its markets with their goods. The EU is a customs union, an anachronism, a child of the 1950s. Who drives a car from that era, owns a TV or uses a telephone from those days? This is a political project with a superstate as the ultimate goal. It is unsaleable to the British as the establishment they well know. Hence the increasingly bizarre arguments of the Remain campaign. Claudio Grass: The polls say that the Leave Camp is gaining ground, but the race is still tight. What would you say would make or break this poll? In other words, should the voters say ‘no’ to leaving the EU, what would you identify as the reason that shifted the vote in that direction? Godfrey Bloom: The danger for the Leave campaign is their failure to make a coherent economic case for BREXIT. The UK is in a very vicious battle for freedom, which must be won. The electorate, press or media cannot appreciate Austrian economic solutions in a campaign of sound bites. Politics is the art of the possible. The UK has been fed a diet of centralized Keynesian economic theory for three generations. It is not conceivable that this can be turned around in one short campaign. Whilst I, as an Austrian economist, would simply declare the UK a free trade area, the press and electorate beg for an alternative to the EU, which they can comprehend, and that is a two-year option of joining the European Free Trade Association (EFTA) whilst things settle down, so that we can negotiate globally at leisure. I lectured at the inspiring Mises Institute a few years ago at the summer seminar. I was put under pressure by the youngsters for suggesting even temporary compromises on Rothbardian Anarcho economics. Back then I was an elected politician who was very keen to get the Austrian philosophy out of the academic cloisters. I still am. Until one has been a politician especially sitting as I did on the EU Economic & Monetary Affairs Committee for 5 years, it is impossible to experience the extraordinary hostility to Austrian Economics from both socialists and conservatives. If I may use an analogy, for the Christian Faith to sweep the world allowed retention of a little paganism around the edges. So I offer the equivalent of the economic Yuletide log. In short, the EFTA is a political solution, but not for the purist. I suspect this would be another rough ride from Misean youngsters. Global Gold: We’ve read in the press that PM David Cameron made a “new settlement” with the EU, with a number of concessions for Britain if the referendum rejects leaving the Union. Among these, are limits on inbound immigration, and on the UK’s involvement in bailouts within the euro zone. What is your take on these concessions? Do they address the concerns of the Leave camp? Claudio Grass: You are a strong libertarian advocate against centralization. In a recent article, you argued: “The failure of representative democracy is largely owing to the scope of government which is too broad. When the government controls every aspect of life no democratic system can cope.” On this basis, how would you evaluate the democracies and parliaments of Europe, and the United Kingdom? Claudio Grass: We watched some of your speeches in the European parliament, where you made some controversial arguments against politicians and our banking system, such as “we are the monkey on the economy’s back”. Could you please tell us more about how you would evaluate our current situation? Godfrey Bloom: Although the UK is engaged in the very important debate on BREXIT, there is a bigger and more important debate yet to come. That is the role of government. What do we expect from the State and what can it deliver? This debate has never been had and is long overdue. It seems the State sees itself as the ultimate champion of the consumer. Therefore, it demands a remit of almost absolute power. This, in addition to corporate and social welfarism, means that we are now ruled by the most intrusive governments in history. This system is doomed to inevitable failure: Ultimately, only the market can protect the citizen. Not only are there not enough resources for the State to take over this role, but also, as every Austrian economist knows, regulation is impossible without perfect knowledge of the market. Only civil servants and politicians could be arrogant enough to believe they can control and steer the economy at will; paradoxically, the same two groups of people with no knowledge of markets by definition. Moreover, any attendants at an EU parliamentary committee can confirm that euro politicians are some form of sub species worthy of careful study in their own right. It has been known since 1920 that sensible economic calculation is literally impossible for governments and central planners…a fact that has been studiously ignored by self-anointed social engineers ever since, even in the face of overwhelming evidence. Claudio Grass: Switzerland is not an EU member state and the vast majority of the population is against joining the EU. Nevertheless, politicians are trying to fuel the same fears that are now stirred in the UK to change public opinion. This perhaps shows that 99% of the politicians all over the world are always striving for more power at the cost of individual liberty. Since Switzerland and the U.K. seem to be in a similar situation, what is your message to the people of both countries? 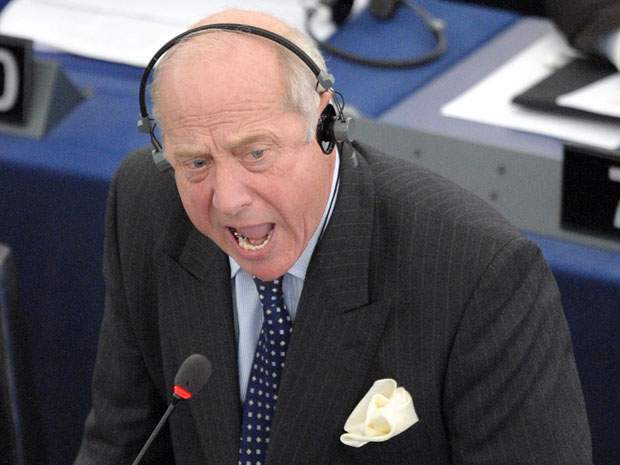 Godfrey Bloom: Switzerland is probably the last living proof that direct democracy is alive and well. At IDDE we promote the phenomenon that a land-locked country with no natural resources, with a small and incredibly diverse population, by sheer democratic efficiency can have one of the highest living standards and most peaceful communities in the world. Yesterday I posted the Swiss poll results on BREXIT on twitter. I have been overwhelmed by the response with over 70% in favor of Brexit. The concept of an advantageous alliance with the Swiss is what might be referred to in the auction room as a ‘new bid’. It will terrify the EU and its apologists. Great Britain, as a major European economy in EFTA, would give that organization a massive piece of artillery. The EU is a typical bully-boy, a major strengthening of EEFA / EFTA would benefit both trade and democracy. Indeed it is impossible to believe major Northern European electorates would not clamor for this option in just a few months of BREXIT. Public support from the Swiss, a much-admired country in the northern states, would provide just the final push we need for a victory. It is difficult for me as a military historian not to look back to 1815 for inspiration. Claudio Grass: Thank you very much, Mr. Bloom. I wish you and the Leave Camp the best of luck in the coming referendum.